Hey, that's terrific. Do you have a link for Project 21? 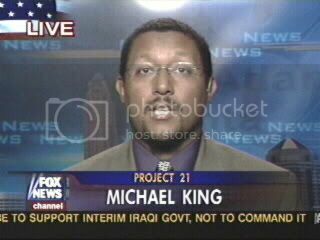 You're THAT Michael King?!? I saw that and you did a great job getting your points across. I just didn't put the two together. I will now though. Great appearance. Keep up the good work. Sounds like you did a good job staying on message, unlike the other fellow. I wish I would have seen you on H&C. I've been stopping by and reading your blog for a few weeks. Sorry I missed your appearance. I agree with you. When Democrats were vying for front runner status, they each spent a good deal of effort courting the "black vote". Since John Kerry has been the presumptious, er.. Presumed Democratic candidate you really have not seen that. He did make an attempt during his MTV interview, but to me that was simply another presumption by someone who really does not have any connection with ordinary citizens in general, let alone ordinary, black citizens.